PreciseMail Anti-Spam Gateway is an enterprise software solution that eliminates spam, phishing and virus threats at the Internet gateway or mail server. Its extensive user controls allow each person in each organization to decide what spam is and what spam is not – giving them precisely the email they want. PreciseMail Anti-Spam Gateway uses multiple email filtering technologies, which make it difficult for spammers to circumvent. The software uses a combination of Bayesian artificial intelligence, heuristic analysis, URL Reputation filtering, DNS blacklisting, and many other techniques (See the PreciseMail Techical Overview for a complete description), which results in a high spam detection accuracy rate without filtering legitimate email. 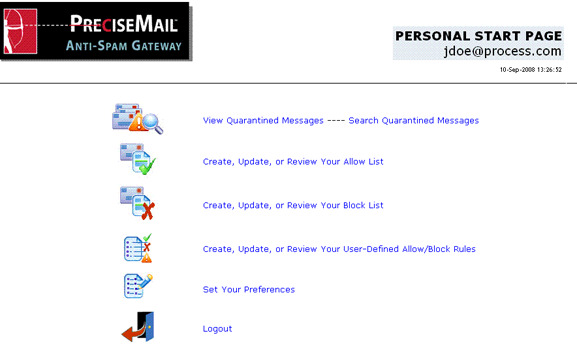 PreciseMail Anti-Spam Gateway has a proven out-of-the-box spam detection accuracy rate of 98%. The product achieves optimum accuracy levels because it analyzes a diverse range of message attributes and content, such as phrases, word patterns, HTML links, forged headers, and other signs appearing in the message header and body that indicate a message is spam, a phishing scheme, or a virus. 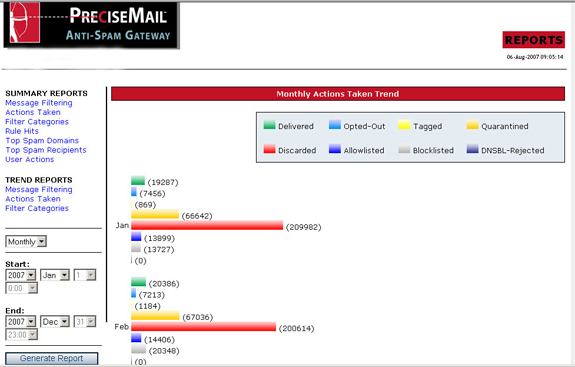 Because spammers are constantly inventing and refining techniques for infiltrating email user accounts, Process Software provides customers with timely automatic updates of filtering rules so that PreciseMail Anti-Spam Gateway’s accuracy is sustained over time. Although PreciseMail Anti-Spam Gateway is an effective out-of-the-box solution, organizations can customize it further to meet site-specific requirements. 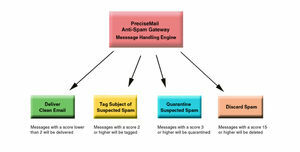 PreciseMail Anti-Spam Gateway evaluates messages against many filtering rules. Any combination of rules can trigger a positive score, which would classify a message as spam. System administrators can adjust thresholds for more or less aggressive filtering. They can also adjust the filter threshold for a particular filter or groups of filters. Users generally have a list of email addresses from known business partners and colleagues that they communicate with on a regular basis. Filtering messages from these trusted senders is not needed, regardless of the message content. 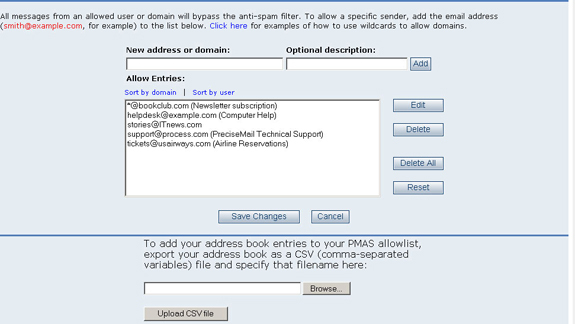 PreciseMail Anti-Spam Gateway provides system administrators and users with the ability to create a list of trusted senders that always bypass the filters. This feature, called the allow list, can be defined by a sender’s email address or a group of addresses coming from the same domain. It is easy to generate this list using the intuitive web interface. Users can also build their allow list without having to manually type in addresses. Users can import their existing address book entries to their PreciseMail allow list quickly and easily through the web interface. Also, when messages are retrieved from quarantine, an option is automatically displayed asking users if they want to add the sender’s email address to the allow list so that all future communication with this person will bypass the filters. Maintaining an allow list has proven to be an effective way of preventing false positives (or the filtering of legitimate email). Users and administrators can use the graphical web interface to create their own message filtering rules that can allow, block, tag, or quarantine a message based on any part of the message body or headers. PreciseMail Anti-Spam Gateway’s filter scoring system allows different actions to be taken based on a message’s final score. Because it is not always clear if a message is spam, different actions can be taken based on the spam score of the message. Messages that are definitely spam can be discarded or rejected. Messages that are probably spam can be quarantined and/or tagged. This eliminates the loss of legitimate email. For example, an email message that appears to have similar traits as spam triggered only some filters, which results in a low final score of two. The message is then tagged as likely spam in the Subject of the email and delivered to the user. Email users can setup filtering in their email client to move tagged messages into a separate folder for review. Email messages with a slightly higher final score of three triggered more filters than tagged messages with a score of two and are also more likely to be spam. In this example, messages with a final score of three are quarantined. Users can review and retrieve quarantined email at any time. System administrators can establish defaults for these message-handling options. They can also provide users with the ability to adjust some or all of these defaults. This allows organizations and users to decide how best to handle spam in their environment. Many departments in an organization have different filtering requirements. 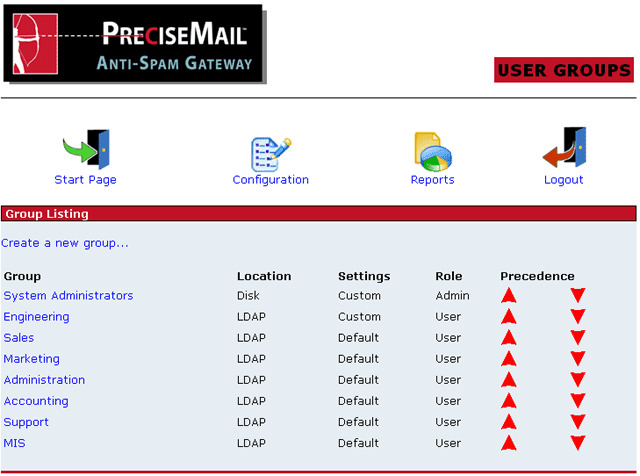 PreciseMail Anti-Spam Gateway gives administrators control over creating and managing different group policy filters. This includes policies over filter thresholds and actions taken once a message has been analyzed such as tagging, quarantining, and discarding. Group policies are identified by using LDAP or manually defined in PreciseMail. For example, in the image below the technical support department does not want to quarantine suspected spam messages to insure that customer problems are seen and responded to in the order they arrive by email. As a result, this department only wants to tag suspected spam messages as a default setting. The accounting department may not be so open to viewing any potential spam email, so the administrator will create a default setting to quarantine all messages at a lower threshold than other departments. PreciseMail Anti-Spam Gateway is a high-performance scalable solution that supports a large number of users with a high volume of email messages. It has been designed to run seamlessly with any enterprise email infrastructure. The software can integrate with an existing email server on the same system or run on a standalone system as an SMTP proxy. PreciseMail Anti-Spam Gateway can be integrated with your existing email server or gateway if you are using Sendmail (on Linux or Solaris), Sun Java System Messaging Server (on Solaris) or PMDF (on Solaris, Tru64, or OpenVMS). This deployment option allows you to take advantage of all the features supported in your existing MTA. 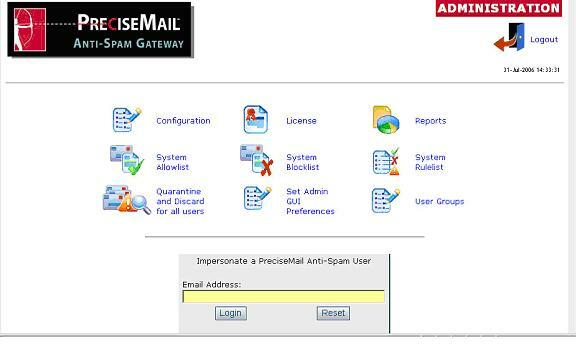 You simply install PreciseMail Anti-Spam Gateway software on your existing email server or gateway. It requires no new MTA or hardware. 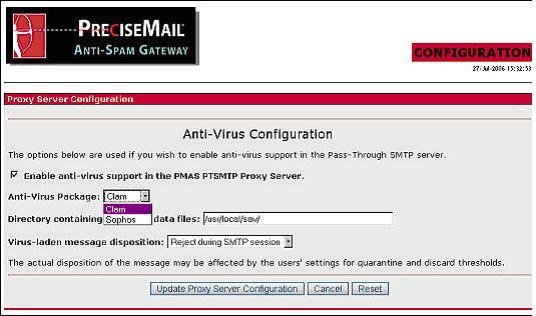 PreciseMail Anti-Spam Gateway standalone version (with SMTP Proxy) works with any email server or gateway. 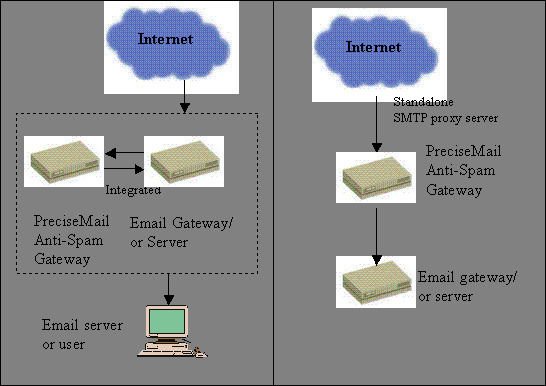 As a standalone solution, PreciseMail Anti-Spam Gateway acts as an SMTP proxy server, which has the ability to receive email from the Internet or another email server, filter-out spam, and then relay filtered email to the destination gateway email server. Filtering email for spam before it is received by the Internet gateway (or email server) reduces the email gateway’s load, and improves its performance. PreciseMail Anti-Spam standalone version supports TLS so that an organization can continue to send and receive confidential email. The standalone version runs on Solaris, Linux, and OpenVMS. Because viruses, worms, Trojan horses and spyware pose a substantial threat to organizations, PreciseMail Anti-Spam Gateway includes an optional anti-virus module with Sophos AntiVirus and/or Clam AntiVirus. The integrated anti-spam and anti-virus solution offers complete email protection at the Internet gateway. It includes a unified centralized web interface and automatic virus definition updates for easy administration.